Brides wishing to make a festive image of acan be more original, often depart from the classical solutions in the color and style of the wedding dress. 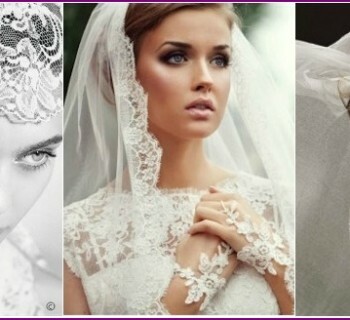 One such successful ways to freshen up a wedding dress - colored veil, which the future wife can pick up a bouquet of colors or accessories in their attire. The special effect produces a blue veil, which makes the image even more sublime, beautiful and refined. 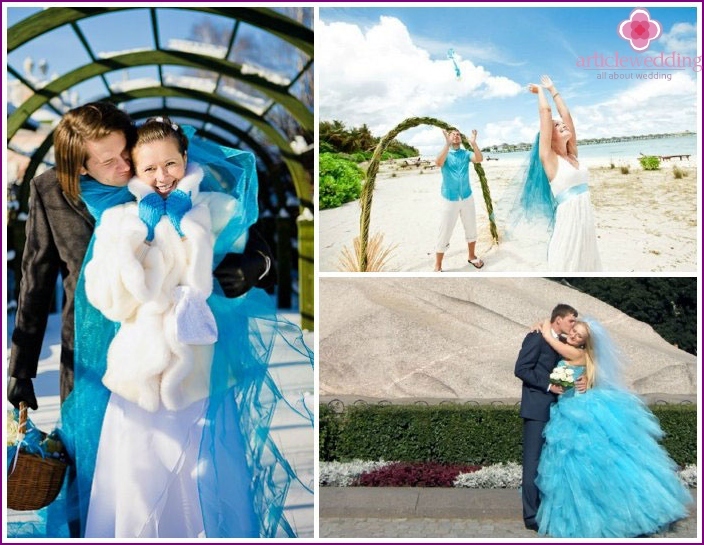 The color of the sky, the purity and coolness is more than ever relevant in such a solemn event and make a wedding photo shoot incredibly beautiful! When the dress blue veil? The deeper the blue accessory, the radiantit will look at the ceremony and photographs. If the bride - priverzhenka traditional snow-white dress, the headdress of the type can be used safely at the bachelorette party. 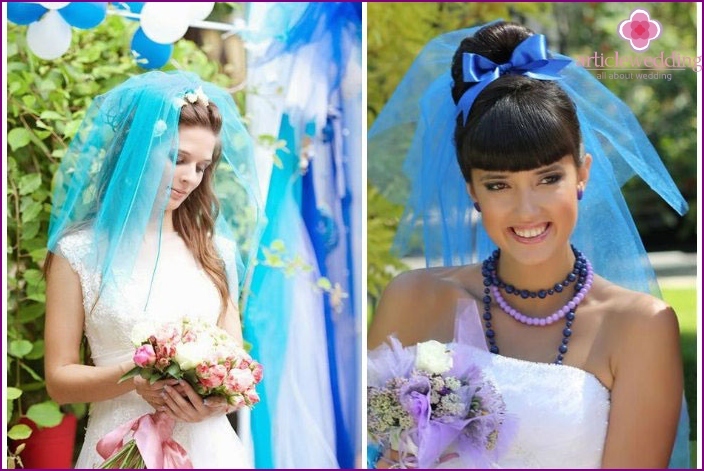 Use decorative elements, which look like a veil, can and girlfriends future wife - it will give an unusual kind of celebration, will provide the girls among the guests, did not overshadow the heroine holiday. White in a wedding dress future wife meanspurity, chastity, the beginning of a new life. However, the blue color does not contradict these characteristics, meaning spirituality, inner purity, peace, and therefore ideal for a wedding. In contrast to the snow-white, sky-blue veil will look much more spectacular. The appropriateness of such colors will be on the thematic celebrations, such as at a wedding in the style of mermaid or sea, as well as if the couple hold a ceremony on exotic islands abroad. Organizing a wedding in a nautical style, it is necessarypick up all the best color scheme, including bridal gowns. 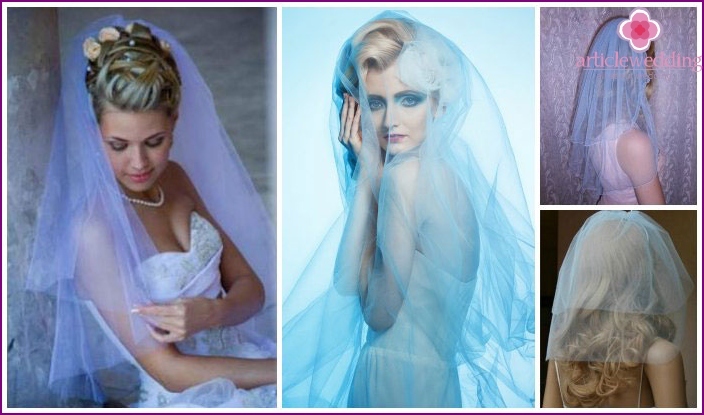 And the presence of the blue veil of the bride image will give more thematic feature of the wedding. This headpiece will look spectacular on the background of the water surface, in combination with a bouquet of summer flowers and the same details of dress (such as stripes). This color has a wide range of shades, so that your wedding decoration looks organic, try to find the right accessories exactly the same color as decorative elements or with a slight difference. 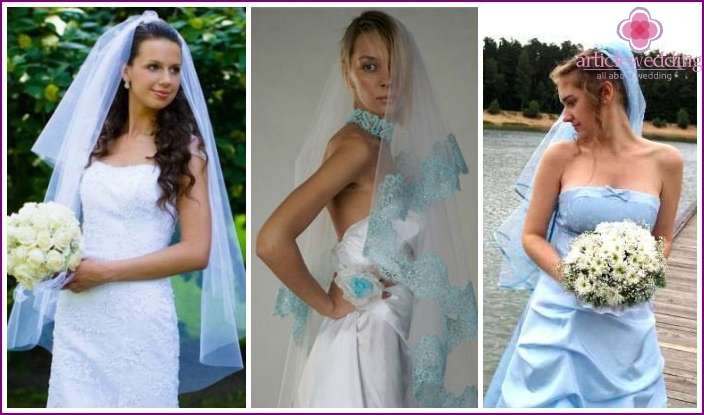 Wedding mermaid style involves a combination ofheaddress azure hues with a dress style "fish tail" (tapering to a lush flared hem). The color of the dress, decor top (neck, shoulder) may be any. Wedding entourage dedicated water azure hue, but without sea elements of style (steering wheels ship, buoys, strips and the like). event script can be fabulous, playing story tale "The Little Mermaid" with a happy ending. Azure veil in this case will help as much as possible to recreate the image of this sea princess. Fata (short headdress) fit in any way and will effectively look at the future spouse, even with jeans and a T-shirt. The blue color here will support the original image. 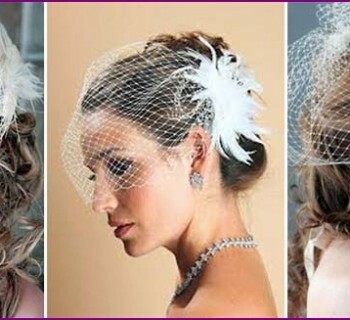 Use different colors for bridesmaids on veilsparty, as in the accessory will be less serious kind. It can be put on all Member bachelorette party (highlighting future wife shade, long veil, or the inscription on the t-shirt) and one bride, and friends will complement your wardrobe with the same hoops with lace, satin ribbons, flowers, wreaths, tiaras or hats.